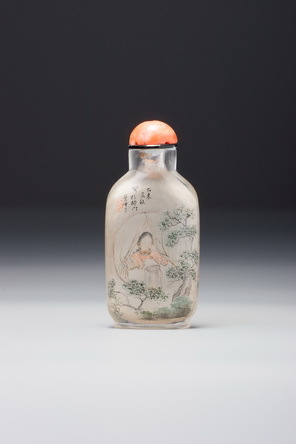 The subject is unusual among naturalistic snuff bottles, perhaps because the most suitable configuration for the bottle form places the magnolia bud upside-down. Unusual, but not unique: see lot 138 in this sale for a set of six bottles of the same subject. Any botanical discomfort, however, is completely overwhelmed by sculptural delight in this particular example. The pebble material has had all its skin removed, but some fissures seem to have gone deeper than the carver had anticipated, leaving a slight brown colour in a pattern of flaws. The carver then used the discoloured fissures to dictate the lines of the petals as they fold together at what would be the tip of the magnolia, which forms the base of the bottle (a base on which the bottle was never meant to stand unsupported, of course). This minor restriction seems to have lifted the artist to new heights where, instead of carving a formal arrangement of the closely folded petals, he has created a completely satisfying and endlessly intriguing asymmetrical arrangement. This is then greatly enhanced by an abstract balance between the gently undulating exterior of the petals, which command most of the space, and small curled-back edges that reveal the interior. Because of the way they are arranged, the eye is kept moving around the bottle as it is turned in the hand. For indeed, like so many of the finest understated bottles, this is a work of art to be fully enjoyed only in the hand. It is an intimate work of art, whose delights are all but invisible at a distance of more than a foot or two. Not surprisingly, it became a very well-handled work of art. Under high magnification, the surface is a mass of tiny abrasions, but to the eye they are read as a softening of the already original gentle polish, still partially visible in protected areas. 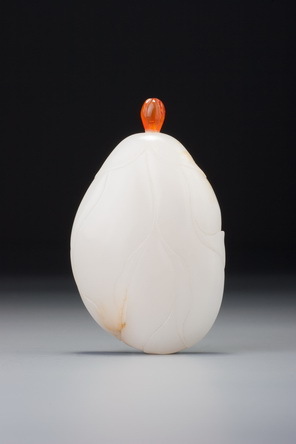 Well-handled nephrite patinates beautifully, and over the centuries a delightful metaphor is created for an important truth in life: softness can overcome hardness, given time and patience.